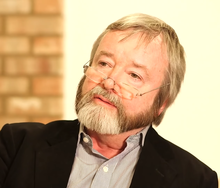 Iain McGilchrist is a psychiatrist, writer, and former Oxford literary scholar. McGilchrist came to prominence after the publication of his book The Master and His Emissary, subtitled The Divided Brain and the Making of the Western World. McGilchrist read English at New College, Oxford, but having published Against Criticism in 1982, he later retrained in medicine and has been a neuroimaging researcher at Johns Hopkins University in Baltimore and a Consultant Psychiatrist at the Maudsley Hospital in south London. McGilchrist is a Fellow of the Royal College of Psychiatrists, and has three times been elected a Fellow of All Souls College, Oxford. According to his web site, McGilchrist currently works privately as a consultant psychiatrist in London, and otherwise lives on the Isle of Skye, off the coast of Scotland. McGilchrist, I.; Cutting, J. (1995). "Somatic delusions in schizophrenia and the affective psychoses". British Journal of Psychiatry. Royal College of Psychiatrists. 167 (3): 350–361. doi:10.1192/bjp.167.3.350. Retrieved 2011-11-14. McGilchrist, Iain (June 2009). "A Problem of Symmetries". Philosophy, Psychiatry, & Psychology. The Johns Hopkins University Press. 16 (2): 161–169. doi:10.1353/ppp.0.0236. Retrieved 2010-02-06. E-ISSN 1086-3303. Print ISSN 1071-6076. ^ a b Kingerlee, Roger; Testa, Rita (2011). "Review of The Master and his Emissary". Neuropsychoanalysis. Karnac Books for the International Neuropsychoanalysis Society. 12 (2): 222–226. ^ a b c Staff (2009). "Scientific and Medical Network Annual Gathering 2009 (pdf)" (PDF). The Scientific and Medical Network. Archived from the original (PDF) on 16 December 2010. Retrieved 2009-12-22. ^ McGilchrist, Iain (2009). "About Iain – Iain McGilchrist". iainmcgilchrist.com. Archived from the original on 23 April 2018. Retrieved 23 April 2018. From the author's web site 'About' page. This article about a United Kingdom psychiatrist is a stub. You can help Wikipedia by expanding it.